"QUY" redirects here. For other uses, see Quy. Gate guardian Canberra PR9 XH170 at RAF Wyton. 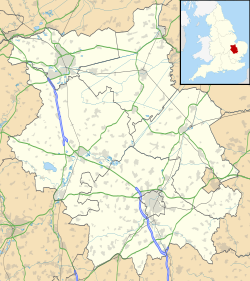 Royal Air Force Wyton or more simply RAF Wyton (IATA: QUY, ICAO: EGUY) is a Royal Air Force station near St. Ives, Cambridgeshire, England. In terms of organisation RAF Wyton was part of the combined station RAF Brampton Wyton Henlow, a merger of Wyton with two previously separate bases, RAF Brampton and RAF Henlow. Wyton is the largest of the three. It is home to Equipment Support (Air) and Corporate Technical Services. The airfield is now decommissioned but was used for flight training by 57(R) Squadron EFT, the University Air Squadrons of London and Cambridge and No. 5 Air Experience Flight. Wyton has been a military airfield since 1916, when it was used for training by the Royal Flying Corps and then its successor the Royal Air Force (RAF). No. 46 Squadron RFC between 1916 and 1916. No. 65 Squadron RFC between 1916 and 1917. No. 83 Squadron RFC between 1917 and 1917. No. 96 Squadron RAF between 1918 and 1918. No. 104 Squadron RFC between 1917 and 1917. No. 117 Squadron RAF between 1918 and 1919. No. 119 Squadron RAF between 1918 and 1918. No. 120 Squadron RAF between 1918 and 1918. No. 130 Squadron RAF between 1918 and 1918. No. 156 Squadron RAF between 1918 and 1918. No. 211 Squadron RAF between 1919 and 1919. In 1935, it was upgraded to contemporary standards. No. 44 Squadron between 1937 and 1937. No. 114 Squadron between 1936 and 1939. No. 139 Squadron between 1936 and 1939. During the Second World War it was used primarily as a bomber base, flying Bristol Blenheim, de Havilland Mosquito and Avro Lancaster aircraft. In 1942 it became the home of the Pathfinder Force under the command of Group Captain Don Bennett. No. 15 Squadron between 1939 and 1940. No. 15 Squadron for a second time between 1940 and 1942. No. 40 Squadron between 1939 and 1941. No. 57 Squadron between 1940 and 1940. No. 57 Squadron for a second time between 1940 and 1940. No. 83 Squadron for a second time between 1942 and 1944. No. 109 Squadron between 1942 and 1942. No. 109 Squadron for a second time between 1942 and 1943. No. 128 Squadron between 1944 and 1945. No. 139 Squadron for a second time between 1943 and 1944. No. 156 Squadron for a second time between 1945 and 1945. No. 163 Squadron between 1945 and 1945. No. 13 Squadron between 1978 and 1982. No. 15 Squadron for a third time between 1946 and 1950. No. 25 Squadron between 1983 and 1989. No. 26 Squadron between 1969 and 1976. No. 39 Squadron between 1970 and 1982. No. 44 Squadron for a second time between 1946 and 1951. No. 51 Squadron between 1963 and 1995. No. 58 Squadron between 1953 and 1970. No. 82 Squadron between 1953 and 1956. No. 90 Squadron between 1946 and 1950. No. 100 Squadron between 1956 and 1956. No. 100 Squadron for a second time between 1982 and 19??. No. 138 Squadron between 1946 and 1950. No. 207 Squadron between 1969 and 1984. No. 360 Squadron between 1975 and 19??. No. 540 Squadron between 1953 and 1956. No. 542 Squadron between 1954 and 1955. No. 542 Squadron for a second time between 1955 and 1955. No. 543 Squadron between 1955 and 1974. After the war Wyton became home to the Strategic Reconnaissance Force, adding English Electric Canberra to the aircraft flown. Vickers Valiants, modified for reconnaissance, moved there in 1955 and a Handley Page Victor in 1959. Provision was made to store nuclear weapons if necessary. The Victor belonged to a separate Radar Reconnaissance Flight (initially of one aircraft - rising to three by the time RRF was disbanded in 1962) to supplement the work of the Valiants of 543 Sqn. The Canberras of 58 Sqn were a mix of PR7 and PR 9s. Also based at RAF Wyton were the T17 and T17A Canberras of 360 Sqn, the only joint RAF and RN Squadron specialising in ECM training. In the early 90's one of its pilots was Ft Lt Rory Underwood. Other residents at RAF Wyton were 100 Sqn with a mixture of Canberra types in the Targeting Role. Also resident but "never officially present" were the three Nimrod R1s belonging to 51 Sqn used in the Elint and Sigint role. During a four-month period in the fall of 1989, two squadrons of U.S. Air Force Fairchild Republic A-10 Thunderbolt II jets were operated out of RAF Wyton while the runway at their base, nearby RAF Alconbury, was resurfaced. During the middle 1990s, RAF Wyton hosted an RAF-sponsored microlight club. Consisting of a small group of flex-wing microlight and 3-axis aircraft, there was a thriving flight school with two instructors, the former Chief Inspector of the BMAA David Marshall and the training instructor pilot Paul Foggoa. The school was based in the old crash building - the original purpose of which was to house the crash-rescue fire engines. The success of the club, and the inclusion of non-RAF members, led to the club expanding to the corner of one of the large hangars. In the mid-1990s the two stations of RAF Wyton and RAF Brampton amalgamated to become RAF Brampton/Wyton. In 2001 RAF Henlow joined RAF Brampton Wyton making the tri site of RAF Brampton Wyton Henlow. At the time it was the largest Station in terms of both geography and number of personnel in the RAF. The 2010 Strategic Defence and Security Review announced the formation of Joint Forces Command (JFC), and on 2 April 2012, the RAF Brampton Wyton Henlow tri site was disbanded. JFC assumed responsibility for RAF Brampton/ Wyton, with RAF Henlow remaining under the control of Headquarters Air Command. The decision to close RAF Brampton by December 2013 led to the command and control of the Station transferring to RAF Wyton. RAF Brampton was renamed Brampton Camp and became a satellite unit of RAF Wyton. RAF Wyton is undergoing transformation through the Programme to Rationalise and Integrate the Defence Intelligence Estate (PRIDE). Under JFC, RAF Wyton will become home to the Headquarters of the Joint Forces Intelligence Group (JFIG). Through JFIG, a number of key components of the Defence Intelligence community have been brought together. JFIG Headquarters will be alongside the imagery intelligence capability of the Defence Geospatial Intelligence Fusion Centre (DGIFC). Formerly the Joint Air Reconnaissance Intelligence Centre (JARIC), DGIFC provides imagery intelligence to the armed forces and other customers. They do this through the use of satellite imaging, as well as airborne and ground-based systems. DGIFC use these sources to provide regional intelligence assessments. Joining HQ JFIG and DGIFC at RAF Wyton from 2013 will be 42 Engineer Regiment. They will be accompanied by elements of Defence Human Intelligence and specialist staff from Defence Intelligence. These elements will come together to support worldwide operations from purpose-built facilities within the Pathfinder Building. In future years, other elements of JFIG and the wider Defence Intelligence community are expected to work together at Wyton. No. 1 Intelligence Surveillance Reconnaissance Squadron of the RAF moved to Wyton from RAF Marham in April 2017. By 2014, RAF Wyton's population grew 5-fold to approximately 1,800 personnel, with every likelihood of a further 1,500-2,000 personnel joining before the end of the decade. Alongside the build-up of the Defence Intelligence footprint at RAF Wyton, the Station also plays host to several Lodger Units. The active airfield hosts the 57 (Reserve) Sqn Elementary Flying Training School, No. 5 Air Experience Flt, 2 University Air Squadrons (UAS) as well as the Pathfinder Flying Club. 57(R) Squadron is responsible for conducting Elementary Flying Training (EFT) for around 50 percent of the RAF's entry of new student pilots. Students arrive following completion of Initial Officer Training (IOT) at RAF Cranwell and remain for around 6 months of flying training on the Grob Tutor 115E. The course is broadly split into 2 phases. During the 1st phase, students are taught the basics of flying an aircraft, fly solo and learn general handling, including aerobatics. The 2nd phase of the course sees the students progress onto more advanced flying, including instrument flying, low level navigation and formation flying. The course culminates in a demanding final test, where all elements taught on the course can be assessed. Following the successful completion of this test, students are moved to either fast jet, rotary or multi engine to continue their flying training. The 2 UAS's teach undergraduate students to fly to the standard of a Private pilot licence (PPL), with additional opportunities to fly Aerobatics, Formation Flying and Low Level Navigation. The Defence Infrastructure Organisation (DIO) also has a large presence at Wyton with both its Operations Accommodation and International elements. DIO Ops Accommodation is responsible for the management of 49,000 Service Family Accommodation in the UK and infrastructure support for the United States Visiting Forces. DIO International looks after the International Estate used by Defence, including the maintenance and provision of facilities on the Permanent Joint Operating Bases. Other units include the Chief Information Officer's Defence Security Assurance Service, the Air Training Corps Headquarters for the Central and Eastern Region, 2331 (St. Ives) Squadron ATC, and the US Defense Contract Management Agency (DCMA). DCMA International maintains a significant presence at Wyton. DCMA International established the headquarters for DCMA Northern Europe at Wyton in 2013. Shortly thereafter, in 2014, DCMA disestablished DCMA Northern Europe and established DCMA United Kingdom (UK). Since 2014, from its headquarters at Wyton, DCMA UK has been providing itinerant contract administration services throughout the UK, Northern Europe, and Scandinavia. In addition, DCMA UK manages its footprints in contractor plants from its headquarters at Wyton. RAF Wyton hosts the annual Pathfinder March, a 46-mile (74 km) walk which starts and finishes at RAF Wyton. On 25 March 2013 it was decided to relocate the flying units here due to the maintenance costs of the airfield. 57(R) Squadron will relocate to RAF Cranwell by Summer 2013. Cambridge University Air Squadron will relocate to RAF Wittering by mid-2014. University of London Air Squadron will relocate to RAF Wittering by mid-2014. 5 Air Experience Flight will relocate to RAF Wittering by mid-2014. Notable units based at RAF Wyton. ^ "RAF Wyton Defence Aerodrome Manual (DAM)" (PDF). RAF Wyton. Military Aviation Authority. 31 March 2016. Archived from the original (PDF) on 28 August 2017. Retrieved 27 August 2017. ^ Jefford 1988, p. 40. ^ a b c Jefford 1988, p. 50. ^ a b c Jefford 1988, p. 54. ^ a b c d Jefford 1988, p. 57. ^ a b Jefford 1988, p. 59. ^ a b Jefford 1988, p. 63. ^ Jefford 1988, p. 70. ^ a b Jefford 1988, p. 39. ^ a b c Jefford 1988, p. 60. ^ a b c Jefford 1988, p. 29. ^ a b Jefford 1988, p. 38. ^ a b c Jefford 1988, p. 43. ^ Jefford 1988, p. 28. ^ a b Jefford 1988, p. 33. ^ Jefford 1988, p. 41. ^ Raynham News (1991). "RAF West Raynham Missile Squadron to be Disbanded" (PDF). Retrieved 28 August 2018. ^ Jefford 1988, p. 52. ^ Jefford 1988, p. 69. ^ Jefford 1988, p. 96. ^ a b c Jefford 1988, p. 97. ^ a b Ellwood:, Tobias (21 December 2017). "Air Force: Military Intelligence:Written question - 120057". UK Parliament. Retrieved 29 December 2017. ^ "Wyton". Airfields of Britain Conservation Trust. Retrieved 10 February 2016. ^ a b c d e "Defence Estate Rationalisation Update" (PDF). Ministry of Defence (MoD). Retrieved 26 March 2013. ^ "Who is based here?". RAF Wyton. Archived from the original on 20 April 2013. Retrieved 17 July 2017. Wikimedia Commons has media related to RAF Wyton. Airport information for EGUY at World Aero Data. Data current as of October 2006.